This section provides an overview of what happens when more than one agency or government requires an environmental assessment (EA). 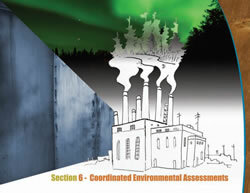 These are called coordinated, joint, cooperative, or harmonized environmental assessments. In this section, we will call them coordinated EAs. This section also discusses situations where coordinated EAs are conducted between First Nation governments and federal and/or provincial agencies. Strategies for participating in coordinated review processes are discussed. The knowledge and expertise of the First Nation communities can greatly add to the efficiency of the EA, and reduce its expense. Like the Kaswentha in the opening story, First Nations do not wish to steer the EA boat but they may be able to help the EA process with problems and pitfalls that arise in the river of the project. First Nation communities are working for the same vision as the EA project –protection of the environment. The Chiefs in Ontario, comprising the 133 First Nations in Ontario, is a political forum and secretariat for collective decision-making, action and advocacy. Copyright © 2011, COOEATOOLKIT.ORG. All rights reserved.